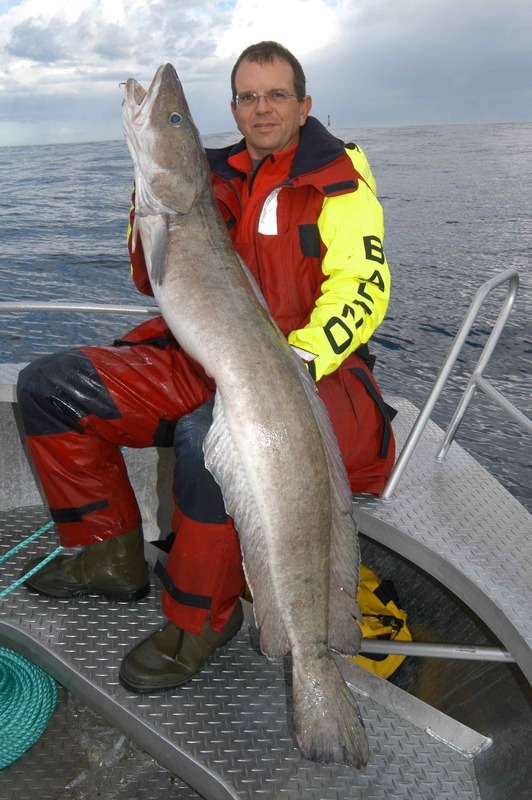 Often during my initial exploratory trips to Norway I had been told about the potential for catching very big coalfish. 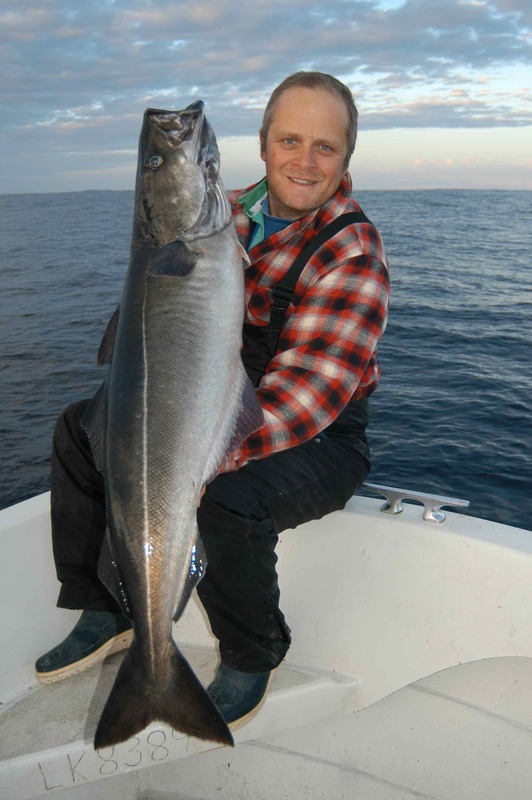 The IGFA all tackle world record is held with a truly monstrous fifty pounder, caught in Saltstraumen in 1995, yet the biggest fish I had personally seen caught during my first couple of trips was around the twenty pound mark…and then I visited Hitra. Hitra is just one of countless small islands that are scattered off Norway’s extensive western coastline, look at a map and you’ll find it located just south of the Arctic Circle, approximately midway between Trondheim and Kristiansund. 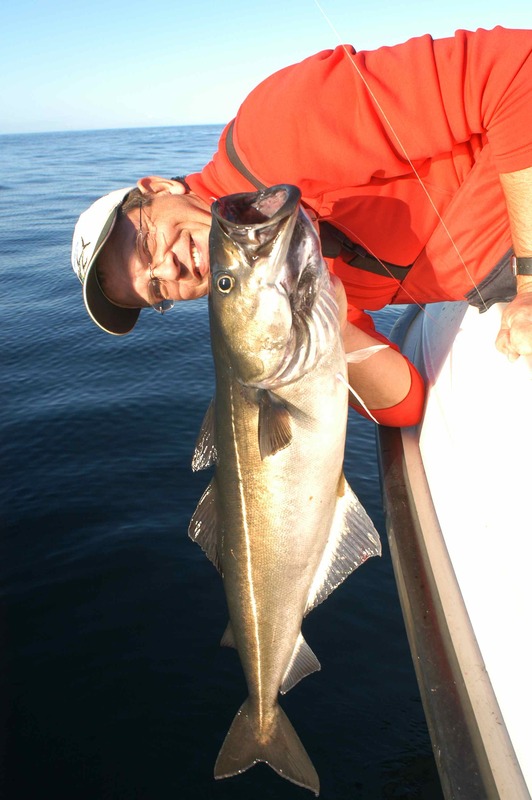 Apart from laying claim to the densest population of red deer in the world, Hitra has for some years been a popular sea angling destination for German sea anglers; anglers like Robert Langford. Robert is British, but he has lived in Germany for many years where he works as an angling photojournalist, and it was Robert who had invited me to fish at Hitra, very quickly tempting me with tales of what he described as truly world class fishing for coalfish. We had arrived on the ferry from Kristiansund, and as we drove off the ferry ramp and onto dry land Robert pulled over and parked. Walking back towards the ferry jetty he explained he wanted to show us something special, and when we looked down into the crystal clear water flowing beneath the jetty we saw huge shoals of coalfish, mostly small fish, 2-4 pounders, though we were tempted to unpack the fly rods. As we watched we saw there were also pollack, the one or two individuals would easily have topped ten pounds. But the biggest surprises of all were several cod in the mid-double range and even jumbo mackerel, all swimming in gin clear water less than 20ft out from the shoreline; already we were convinced Hitra was a special place! Unlike at many of the fishing destinations I have visited in Norway where often we fish within the fjords, the serious fishing at Hitra takes place offshore in the open sea. In the event of bad weather there is ample fishing to fall back on in sheltered water within the profusion of smaller islands, isolated rocks and shallow reefs around the main island, but to get to the best coalfish area entailed an hours run in a fast boat. Long before we actually reached the fishing grounds we could clearly see the area we were heading for. It was late afternoon and the weather conditions were perfect. The surface of the ocean was a glassy calm, with just enough swell rolling in from the Atlantic to create a fringe of breaking water and indicate the location of the many shallow water reefs. The hot spot was marked by hundreds of feeding sea birds, and as we got closer we could see one boat was already fishing. Moving closer still we saw that both anglers aboard her were hooked into what judging by the healthy bends in their rods were decent fish. As Robert slowly manoeuvred the boat into position within casting range of the feeding birds, he explained the technique involved casting the 40 gram lures our light spinning rods were rigged with as far as possible, then allow it to sink swiftly down through the water column. 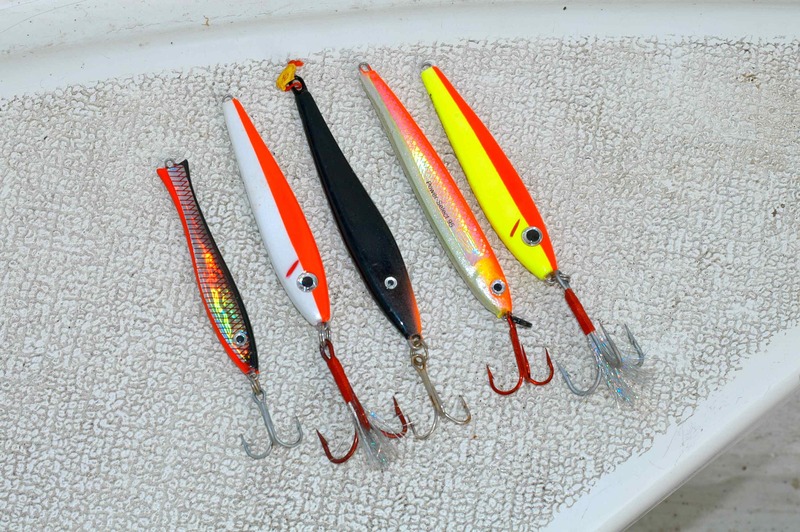 The lures were retrieved swiftly back towards the boat, occasionally stopped and allowed to once again drop vertically down through the water, then swiftly retrieved again. What happened during the next few hours as the sun slowly fell beneath the horizon was one of my most memorable fishing experiences ever. My travelling companion Paul Bowen had hooked into the first fish of the session almost instantly, and as his reel clutch screamed the bend in his rod confirmed it was a big fish. At this stage typically I would have stopped fishing and started taking photographs, but as I quickly reeled my lure in it was stopped dead in its tracks as I became fast to what obviously was another good fish. Looking to my left I could see that Robert, too, was busy with a third fish. Three hooked fish in the first few minutes of fishing. Paul’s first fish weighed in the region of 8lb, both mine and Robert’s were slightly smaller, yet while Paul and I were positively enthused by the quality of the sport, Robert insisted we had yet to experience anything like this magical areas true potential; was that an understatement or what! During the next hour of fishing we discovered that those first three fish were indeed small, and that the average size of fish here weighed better than 10lb. The action was constant as I frantically tried to catch fish myself in between shooting Robert and Paul with their fish. And it wasn’t just coalfish that we caught. 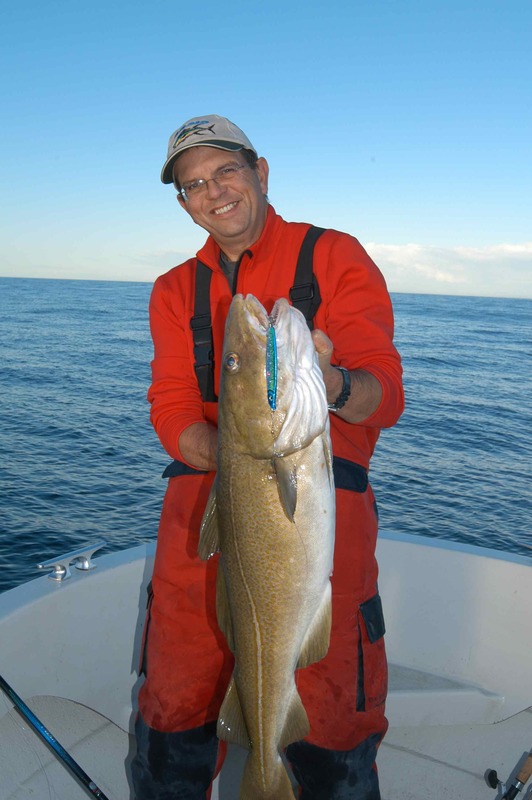 Among several pollack caught were specimens weighing well into the double figures, and we also took cod to over 15lb. 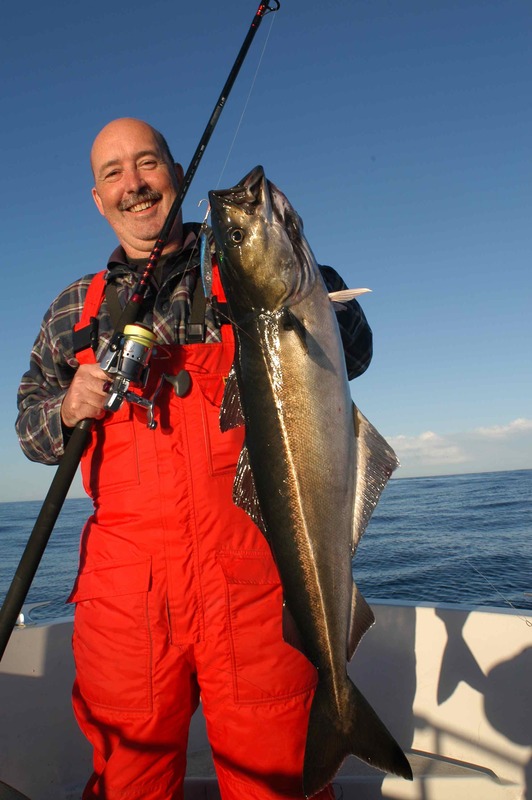 This was light tackle sport fishing at its absolute finest, but the best was yet to come! On one drift my lure was literally slammed to a dead stop by what I could instantly feel was by far the biggest fish I’d hooked. The little spinning rod bent to what must have been close to its structural limit as many yards of braid were ripped from the reel. For a long time all I could do was hang on as the fish dived deep but thankfully I had hooked it close to the surface and there was little chance of it snagging me on the bottom, we were fishing over 200ft of water. Eventually the runs and powerful dives slowed and the fish began to sulk directly beneath the boat, yet for a while every time I managed to gain a few yards of line the fish would power off and regain it all, plus some. Paul and Robert continued fishing, hooking and landing several fish while I slugged it out with my fish, all of the time expecting either the line to give or the hooks to pull free, but everything held fast and after the better part of twenty minutes I started to regain some line. Slowly but ever so surely I pumped the fish towards the boat, eventually getting to the stage where I could look down into the depths and see the first tell tail flash of colour of the fish beneath the boat. By now I had all but convinced myself I had foul hooked a double figure coalfish in the back, but when that first fish came into view I could see it was indeed a big fish, and I called it as a decent cod. “Not a cod Dave,” Robert announced as he leant over the side, “a coalie, and a good one!” As he reached over the side and grabbed my fish by the gills and hoisted it aboard, the diminutive little pirk hanging from the corner of its mouth, I was absolutely staggered…it was huge! We had no scales aboard, but we all agreed it was easily a thirty pounder, certainly I had never seen a coalfish like it. It was a very fat fish, yet its flanks were rock hard with solid muscle and beautifully marked, with an ebony back that was tinged with purple and gleaming pewter belly, the two separated by the characteristic straight white lateral line. I couldn’t take my eyes off it. By now it was all but dark so reluctantly we stopped fishing and headed back to the fish processing shed adjacent to our camp, where on a certified set of scales my fish registered 33lb 8oz, with Roberts biggest 28lb. The following day we were up at dawn and heading straight back to the same area, but as soon as we cleared the narrow outlet between the last two barrier islands and nosed out into open water we could see the swell had increased significantly, while the wind appeared to be freshening by the minute. It was a long, wet and very sloppy ride out to the fishing grounds, and as we drifted it was as much as we could do to stand let alone fish, but the flocks of screeching birds confirmed the fish were still there, and as we soon found out if anything the average size was even bigger. Paul soon landed a beauty of 29lb 8oz, Robert taking a second of around 25lb while I boated its twin. 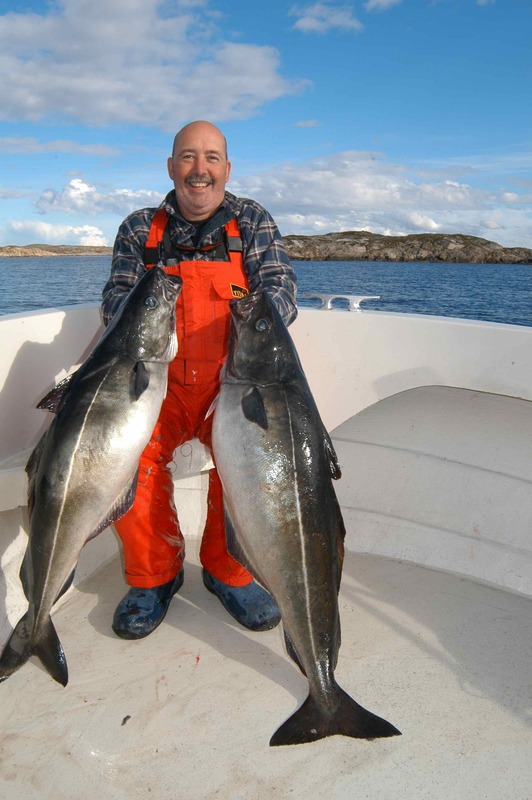 I simply could not exaggerate just how good the fishing we were experiencing off Hitra was. But all good things come to an end and after little more than an hours fishing the wind and swell had increased to the point where it would have been dangerous to continue fishing. Reluctantly we made our last casts, caught our last fish, reeled in, stowed the rods and headed back inshore.